We have all gotten used to hearing about exciting inventions in China. 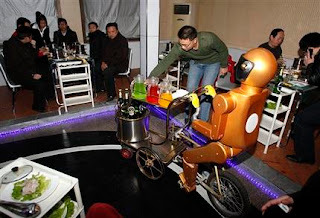 Yet again we witness another interesting invention with the use of Robot waiters at a Chinese restaurant. The robots move around on a conveyor belt and stop whenever a customer is around to pick up the food in the tray they are carrying. It doesn’t stop with serving robots. The restaurant also makes use of entertainment robots and others that greet and welcome customers when they walk in. The greeting robots are sort of female; I’m not sure whether robots have gender. 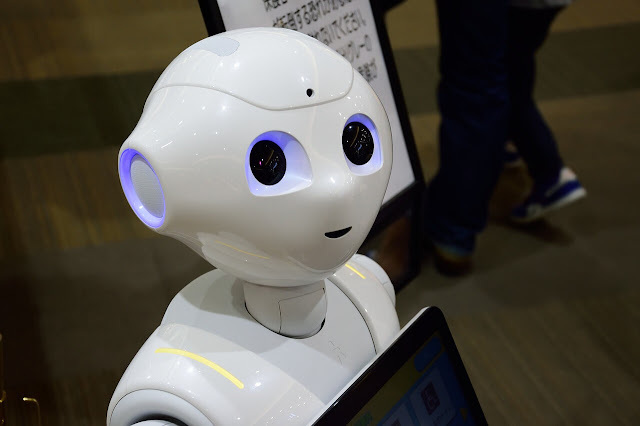 The introduction of robots, mainly as servers is partly due to the fact that human beings can be impatient, tired and so easily irritated at times but robots will keep on doing their job till the end of time without being bored as long as there is electricity. How do the robots know when to stop? Robots may be made with eyes but that does not mean they make use of them the way humans do. These restaurant robots make use of sensors. The sensor detects the presence of a human being and stops for the person to pick up the food in the tray before moving on. The greeting robots greet and the entertaining robots talk and dance by flapping their arms around. It sounds like China’s the place to be when in search of innovative technology. The introduction of robots into industries might well put a lot of employee positions under threat. But that really depends on the cost and effectiveness of those robots. The owner of the Chinese restaurant, Zhang Yongpei, is thinking of making about thirty more robots in the next few months with each having a price tag of $6000 each. The innovative Mr. Zhang is also planning to make new robots with more qualities as those of human beings. He is planning to make robots that can move around and respond to customer enquiries and also serve them at their tables. Technology never ceases to amaze. But how would it feel to have a robots serve you and a restaurant or store? What do you do when your grammar is not the type the robot can understand? Well you just get up and give it hard knocks on the forehead but let’s hope the robot isn’t programmed to get angry.